Well the latest trailer for Godzilla was just revealed thanks to Legendary Pictures, and if you’ve been following my reviews the past few months, you know how this movie keeps looking better and better. Well the latest International trailer keeps the momentum going and gives us what might possibly be the last look we get at the monster before he awakens in theaters May 16th. So what did this trailer give us that others haven’t? Well, it gave us the thing that no Godzilla movie is complete without: GIANT MONSTER BATTLES!!!!!!!!!!! Again, if you’ve been following along, you know by now that the atomic bomb tests that are usually associated with Godzilla creation myths have been changed and are no longer the cause of the monster’s creation, but rather were all attempts to kill it. The one piece of info we were always missing was where did the other monsters – named Mutos – come from. We saw nuclear waste sites as well as strange hive like structures built around radioactive weapons, but nothing was ever confirmed. Will this movie be man’s monsters vs the monster that is a force of nature? Well, yes and no. As we see in this trailer, there is some sort of strange asteroid-like object that a military installation has been built around. This object could also be what Bryan Cranston’s character Joe Brody thinks the military has been ‘hiding’ from them. As we learn in the new trailer, man might no be able to stop this new threat, but something can. In addition to the big reveals of this trailer, we also get the most sustained look at the new monsters as well as the one and only King of Monsters, Godzilla. If you saw the WonderCon footage – or read my article on that – you know that Godzilla and the Muto 2 not only battle it out at Honolulu Airport, but that there is a HUGE size different between the two. Could this be the evolutionary progress of the same monster throughout the film? 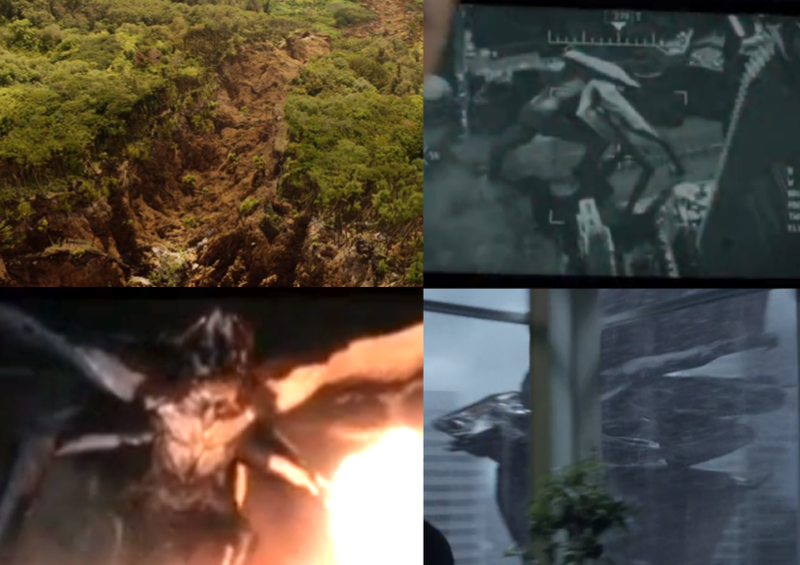 Judging from the size difference and the different fight locations, its safe to assume that there is more than one Muto – especially if you are familiar with the extended look footage. Though despite there being more than one Muto present, that doesn’t necessarily mean they are different types. The monster shown attacking Honolulu has a striking similarity to the one shown on the monitor in the Extended Look footage. Both are mantis like, but one has grown wings. The monster we see in this footage is that flying V-shaped monster we saw in the first International Trailer that people misjudged as another falling plane. It has extremely developed wings but also retains some mantis-like qualities. In all seriousness, these are all evolutions of the same monster, which probably undergoes some sort of metamorphosis throughout the film and grows like a normal insect. This could also explain the worm like trail left through the jungle in that first footage. All of these questions and theories will be answered in time. In the meantime, don’t forget that before Godzilla hits theaters a book titled Godzilla: The Art of Destruction will be released with all of the art of the film on May 13th. In addition to this art book, a prequel graphic novel entitled Godzilla: Awakening will be released on the same day as well. So stay tuned for more updates as we get ready for the release of one of the BIGGEST movies of the year.